Mummies! Classic Monsters of Pre-Code Horror Comics. Soft cover, full-color book from IDW and Yoe Books, publishers of Haunted Horror and other titles. Movie mummies will soon be terrorizing theater goers! Now, from the boils and ghouls who bring you Haunted Horror, scream with delight over these stories unleashed from Pre-Code horror comics. SEE! 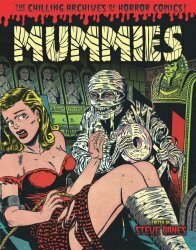 The brutal attack of "The Living Mummies!" SENSE! The strangest "Case of the Beckoning Mummy!" FEEL! As "The Unburied Mummy" intensifies its powerful grip upon your puny throat! And, there's a tomb-full more! PLUS! A crumbling gallery of classic mummy comic book covers and spine-tingling guest appearances by Frankenstein's Monster and Charlie Chan! You'll be screaming for your mommy as MUMMIES! shamble into your trembling hands! Brand-new. June 2017. 128 full-color pages. Soft cover, square-bound book. Shipping Note: This book qualifies for economy Media Mail shipping (only books, DVDs, and videos qualify). However if your order also includes items that do not qualify, you must choose another shipping option or purchase this or other books, DVDs, or videos separately from those items.